Your indoors cat's litter is probably safe for you to touch during pregnancy. Kitty litter has a bad rap when it comes to pregnant women, but you don't have to panic if your furry feline needs her box cleaned out. While parasites that can infect your cat's digestive tract may be in her litter box, you're probably safe if she's an indoor cat. While few diseases pass between cats and humans, one that does is toxoplasmosis, passed by Toxoplasma gondii. In most people, toxoplasmosis doesn't cause symptoms at all. However, a pregnant woman can pass the disease to her unborn child, which can result in birth defects or miscarriage. Cats typically get toxoplasmosis by eating or chewing on a contaminated rodent or other raw meat, so indoors-only cats fed commercial dry or canned food shouldn't catch it. Kitty litter is a potential route by which humans catch toxoplasmosis because the parasite is found only in a cat's feces, not on her fur or in her saliva. Because the only way a person can get toxoplasmosis is for the parasite to get into her mouth and digestive tract, it's a risk only if you touch contaminated litter and then touch your mouth without washing your hands first. Even then, there may be little risk if the litter has been completely changed every day, because the parasite takes one to five days to incubate in the stool before becoming infectious. If your kitty has never been exposed to the parasite, there is no way for her litter to become infected. Kitty litter isn't the only place where you might encounter the parasite that causes toxoplasmosis. Raw or undercooked meat can harbor the parasite. In fact, the Center for Disease Control says that you are more likely to get toxoplasmosis from undercooked food than from your feline companion. Another potential source of toxoplasmosis is contaminated soil -- so if you garden, be careful not to touch your mouth with unwashed hands. Even if your hands look clean, you might have accidentally picked up some microscopic parasites. 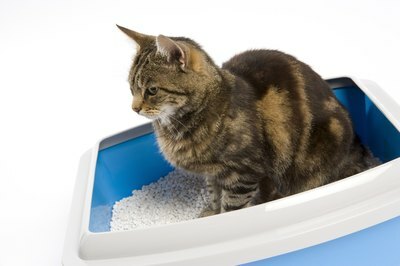 Just because handling your cat's litter could be risky doesn't mean you need to give up your pet while you're pregnant. Have someone else in your household handle the kitty litter while you're pregnant, to eliminate the risk completely. You should also keep your cat indoors to prevent her from contracting the parasite, and avoid handling stray cats.